Aren’t those good words to live by? As a demonstrator, I try to spend time every day at my stamping desk, but sometimes I just don’t make it there, for one reason or another. And when I don’t, I find that it shows in my mood. Being able to spend time being creative, for creativity’s sake, is the best way for me to unwind, relax and get a fresh perspective on things. This is my 2nd card, made for my card swap with friends just before I went on holidays. (yes, I pre-wrote and scheduled this post! as you’re reading this, I’m in Glasgow, Scotland). The main stamp set I used is called Crafting Forever. 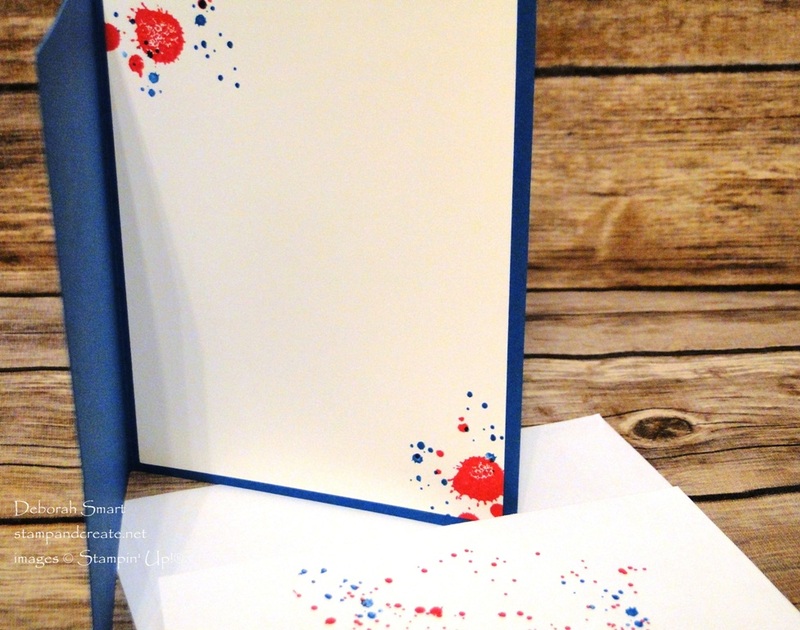 I think it’s a terrific stamp set for making your creative statement! 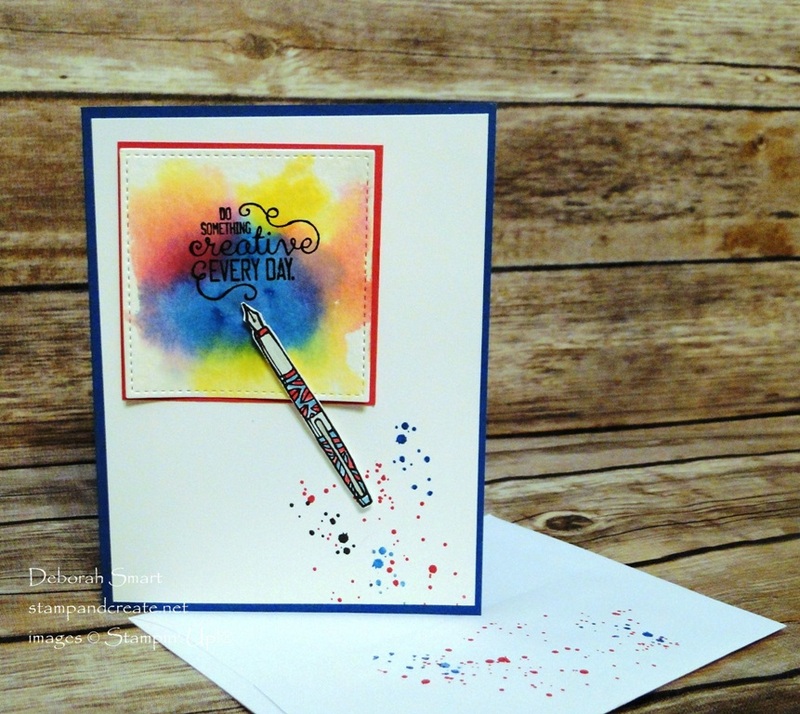 I had seen a similar card made by Lisa Curcio,a demonstrator in the U.S., and decided to create my own version. 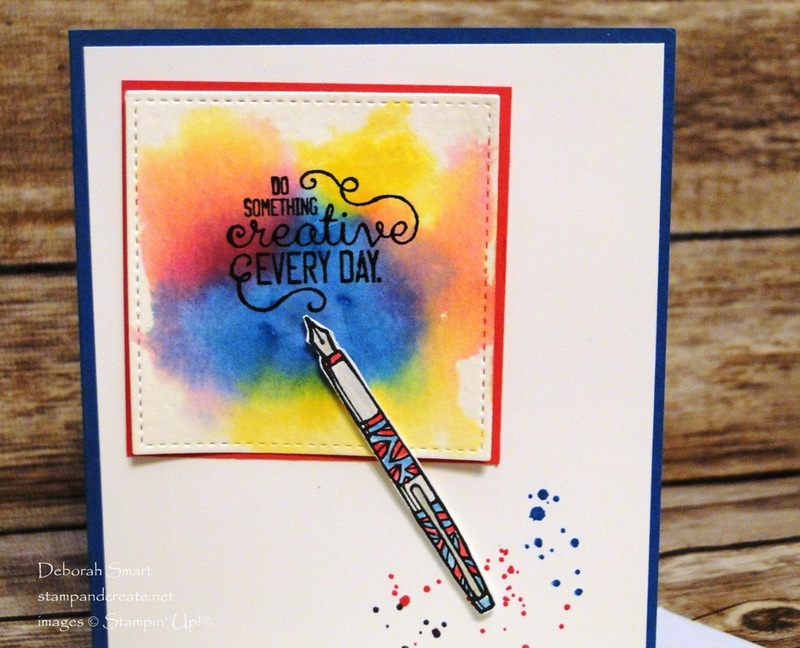 First, you want to created the watercoloured background – so get ready to have fun! I started by die cutting a square of Watercolour Paper using the Stitched Shapes Framelits and Big Shot. Next, prepare your workspace, as you’re going to use some water. Use an Aqua Painter or wet paint brush, and wet down your Watercolour Paper (I wet both the front & back). I use my Clear Blocks as my ink receptacle; I place a drop of each ink colour in Pacific Point, Daffodil Delight and Melon Mambo on clear blocks. Then you want to use your wet Aqua Painter and pick up one colour at a time. Hold the inked Aqua Painter just above the wet Watercolour Paper, and squeeze gently to release the ink onto the paper. Watch it spread, and enjoy! Repeat this with each colour, cleaning your brush before changing colours, until you’re satisfied with the look. Set this aside to dry, and cut a 4″ x 5 1/4″ panel of Whisper White cardstock. Use the retired Gorgeous Grunge stamp set and current Timeless Textures stamp set to add the colour splatters on the bottom corner of the panel. This makes it look like you got a little overzealous with the creativity – but in a good way! On a small piece of Whisper White, stamp the pen image in Basic Black or Memento Black ink. To colour the pen, I used my Blender Pens and picked up ink from the inside of the ink pads. The colours I used on the pen are the same as the watercolouring; Pacific Point and Melon Mambo. Fussy cut the pen with your Paper Snips. By now, your watercolour piece should be dry; stamp the sentiment in Basic Black or Memento Black in the middle of the square. Cut a square of Melon Mambo cardstock so it is 1/4″ larger than the die cut square, and layer the 2 together with Stampin’ Dimensionals. Attach this to your ‘splatter’ stamped Whisper White panel. Now you can attach the pen; because of the height difference caused by the Dimensionals, I used a 1/2 Dimensional on the handle of the pen, and a single Mini Glue Dot on the pen tip. The next step is to layer the large panel onto your card base of Pacific Point cardstock. Because of the sentiment on the front, I think this card could be used for a variety of occasions. So, I didn’t stamp a sentiment on the inside, but did add some more ‘splatters’. The interesting part about this technique is that no matter how many times you do it (I made 7 cards in a row), you’ll never get identical outcomes! 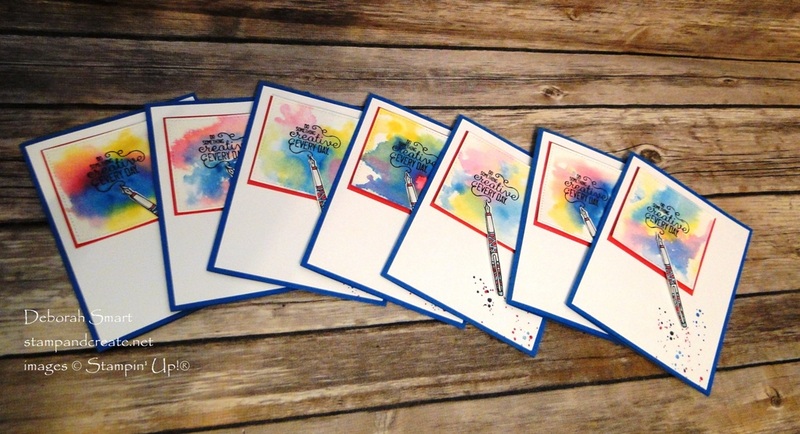 Whether it’s ink intensity, the way that the ink flows, the wetness of the paper – it all plays into making each project an individual work of art 🙂 Here’s a look at the 7 cards I made; you can see how each one is a bit different. I love that everyone got a card that was a bit different from the one received by the next person! I highly recommend trying out this technique – it’s so fun, easy and thoroughly therapeutic 🙂 Order your supplies by clicking on the images below. This will take you directly to my online store, where you can order anytime, day or night. As a thank you for ordering with me while I’m on holidays, everyone who places a minimum $25 order (before tax/shipping) using HOST CODE NPSAM4B2 will receive a special gift from me in September – from the Holiday Catalogue! Thanks so much for stopping by today. Have fun – and do something creative today! Next Next post: Sightseeing in Edinburgh, Scotland! This is lovely, Deborah! Great tutorial, too, and very easy to follow. (And, great minds…I’ve have three panels of watercolo(u)red paper on my table for two weeks, just waiting for that sentiment to be added. I knew it needed something, though – and the pen will be a perfect addition! Deborah, this is a wonderful, beautiful card! I never thought about wetting both the back AND the front of the cardstock. will have to try that! I love this card. It is so colorful. This is a great tutorial too. Looks like it is going to be CASE time!